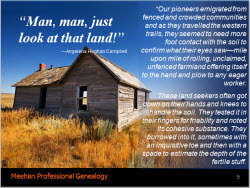 "Finding the Ancestral Trail: Immigration and Migration"
The solution to finding an immigrant’s origin is often in evaluating records held in the country they emigrated to. To be successful, researchers need to build a solid trail of evidence to their earliest immigrant family member, including collateral lines. Unless a village is known, researching collections in the migrant’s cultural country can be cumbersome or impossible. However, in recent years historians have unearthed shrouded emigration resources in foreign archives. With skilled expertise, we can envision a brighter future in reconnecting expatriates to North America with electronic technology.